Will you please stop leaving that small bald spot of less than 30cm2 on the crown untouched during the first procedures even when you are covering the front top and back. There is no written rule that says you have to do this. There is no real need for it. It’s not funny and it’s not clever. I reckon you’ve cracked it. So my choice of surgeon is now so simple. I have to go for a surgery with someone with a short name. I had booked surgery with the brilliant lebonese HT surgeon Dr. Sewarepimawobensica but I may change my mind now. In Hair Transplantationby Unger and Shapiro, there is an interesting perspective that might help. (I am paraphrasing here). What is described here is the nature of the hair in the crown and the way alopecia affects the crown. Because of the whorl pattern and the vertical plane, it takes much more hair to be able to provide coverage than compared to areas like the hair line or frontal third. Although the surface areas can be comparable, the amount of hair needed for coverage is far greater in the crown. The other problematic aspect is the long term results to the patient. As hair loss progresses in the crown, it is noticible much quicker and it looks very unnatural than when compared with continued loss in the hairline or frontal third. When the recession in the crown continues, it leaves an island of hair in the center of the crown. This is sometimes termed a “devil’s halo”. It forces the patient into further surgeries and can be difficult to keep up with even if time, donor availability, and money are of no concern to the patient. Because there is a finite amount of donor availability, it is important to prioritize your hair transplant goals. Hair lines and frontal thirds frame the face and establish coverage with less hair. Grafting these areas can often stand alone in a natural appearance even as the hair loss progresses. Perhaps that helps explain the untouched crown trend that you see. » I appreciate your humor. » interesting perspective that might help. (I am paraphrasing here). » money are of no concern to the patient. » Perhaps that helps explain the untouched crown trend that you see. I agree with some of these comments. There is certainly an expansion of the crown hairloss and the weakened area is detectable even if the fringe area is robust on superficial inspection. The rest of this does not add up. A “devils halo” is one thing but these surgeons transplant to the crown just leaving a bald spot in the middle. Further egression with this philosophy will look a lot more stupid than a devils halo, it will look like a floating ringed donut! I think that the truth is that many Ht surgeons struggle with the angulation of the crown whorl or are too lazy to put the effort, justifying the decision with the comment that you have quoted. A notable exception is Dr. Hasson who ensure the worl is covered and the angulation is fine. The idea that it takes more graft is erroneous since a thin whorl is O.K and looks a lot more sensible than the mandatory bald spot. » area is robust on superficial inspection. » surgeons transplant to the crown just leaving a bald spot in the middle. » devils halo, it will look like a floating ringed donut! I like the term “floating ringed donut”! It is very descriptive. Can I start using it? I think the purpose to grafting the perimeter of the crown is to return the patient to an earlier stage of crown loss because there is not enough hair available to create a full crown. It depends on the patient’s situation, degree of loss, etc. But, when grafting the perimeter, extreme care and planning has to take place to make sure that either A) you are grafting into areas of existing hair in the perimeter that will probably be lost in the future or B) the patient is fully aware and in agreement with the fact that they are going to need further surgery to keep up with the perimeter. » is O.K and looks a lot more sensible than the mandatory bald spot. I mostly agree. It could be several reasons like laziness or lack of knowledge and skill. It could be that they don’t want patients to have to live their lives looking unfinished or unnatural if some unforseen event prevents them from touch up sessions to keep up with the loss. Thin coverage is a much better expectation for the crown when the loss is significant, but even thin coverage in a whorl takes more hair than areas with less circular patterns. I have heard before that Dr. Hasson has good crown angulation. Do you have any pics or links? I think it would be helpful to the board, even if it is a repost. » it is a repost. 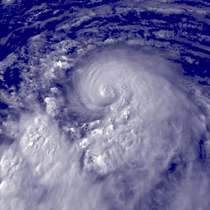 BTW, just to demonstrate how closely this aligns to nature, I had a shot taken from outer space which shows a remarkable resemblence of this crown work to huricane DEAN. » » it is a repost. That is a great example of the correct angles for crown transplant. You can also see the miniaturization around the perimeter of the crown. Great example; nice find, marco! » work to huricane DEAN. The best way to create a natural look is to imitate nature itself. Another very cool pic, marco. Marco I totally agree with you, besides I would rather have a thin look all over than a thick hairline with the crown bald. I never buy the reasons the doctors use for leaving the crown bald. Some of the excuses they invented are absurb but since they are doctors everyone just goes along with it. » are absurb but since they are doctors everyone just goes along with it. Well, how about this and it is a serious proposition. 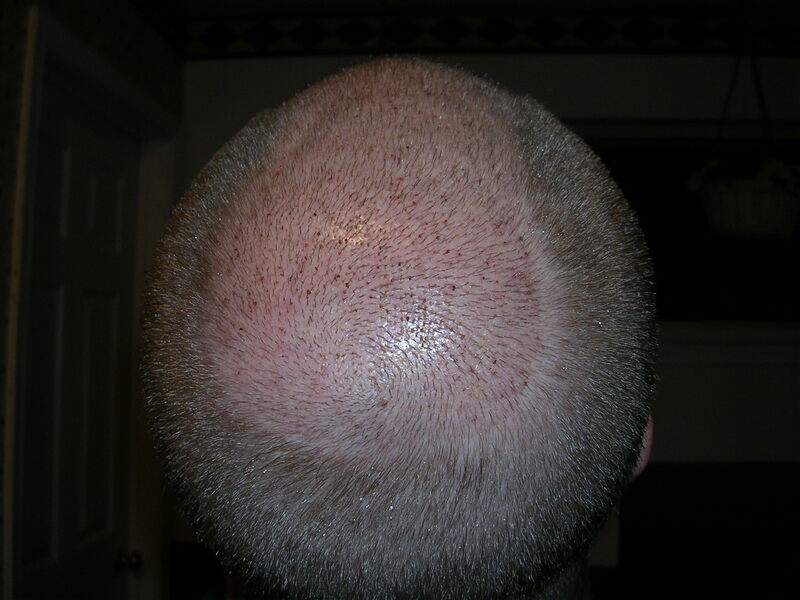 A transplanted line including the swirl in the middle of the crown from back to front leaving bald spots on both sides. Actually I think that is a very natural configuration during the baldong process and could take further expansion of the bald spot. I am almost certain that I will go for a variation of this but include a very thin coverage on either side of this line. » this but include a very thin coverage on either side of this line. I am not suggesting to transplant the centre of the circle, I am suggesting transplanting a line similar to a mohican (with a cross on the vertex where the hair is often resistant to balding). I know It sound totally ridiculous but I will have to draw it out. » » this but include a very thin coverage on either side of this line. Ya i dont know why they do this either, I saw a after pic just recently and the crown was completely bare with a perfect line across the centre vertex of the head, it looked completely unnatural. 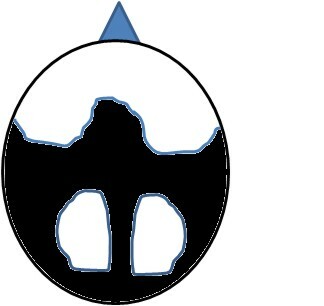 The first one is that, if you are a young male, say, under the age of 30 or even 35, that small circular area you see presently can over the next 10-20 years increase in size logarithamicly to a huge area, leaving previous transplant work looking like a splotch of hair with a halo around it and no donor hair remaining to fill in the halo. Male pattern baldness is progressive throughout our lifetimes. Secondly, if a person does in fact require transplanting throughout the frontal and midscalp areas, which in itself is a huge area, in order to do justice to filling in that area at the first session, to add onto that getting enough grafts to also fill in the crown in back is asking for an awful lot of donor hair, which means that the donor strip taken will have to be very long and very wide, which sets up the very real risk for a wide, ugly donor scar that will be hard to hide. Third, even if one could get the needed donor hair to do all three zones - the frontal, midscalp, and crown regions - I have discovered in my own practice that the growth and survival of the FU grafts placed in the crown is diminished. I did a study of one particular fellow in whom the growth was poor in the vertex after his first two procedures, in which I did in fact try to fill in all three areas. I then had him come back for a third procedure, in which I only transplanted the crown (vertex) with 1500 FU’s and tattooed off a study box to calculate the exact survival, and found there was excellent growth. The exact reasons for poor growth some of the time when the whole head is tackled is not clear. My own suspicion is that it is just asking too much of the blood supply to the scalp, especially in the back, where you have the donor scar beneath those grafts and in front of it you have the thousands of grafts necessary to do justice to that area. If a person is old enough to have all three zones filled in and has enough donor hair, my preferred method is to do the top (front two zones) at the first two sessions and then do the crown separately at a third visit 10 months or more later. Very intersting so it makes sense to do smaller sessions over time which thank goodness is the approach I am planning to take anyway. Can other doctors comment on this blood circulation theory ?